Italian jurist and political economist; born at Modena June 25, 1868; died there Dec. 6, 1901. After studying law at Modena, receiving the degree of doctor of laws in 1889, he was sent by the government to Padua and London for further study. On his return to Modena he became lecturer at the university, being made instructor in finance in 1892. In 1898 he was appointed assistant professor on the faculty of law. He died suddenly on the same day on which he had been named for the full professorship. Conigliani was an earnest student of economics, being attracted especially to the problem of the effect of duties and taxes on the masses. When Minister Wollemborg was planning in 1901 a thorough reform of taxation, with the object of relieving the poorer classes, he called Conigliani into the ministry of finance as scientific adviser, to help him in elaborating his measures. 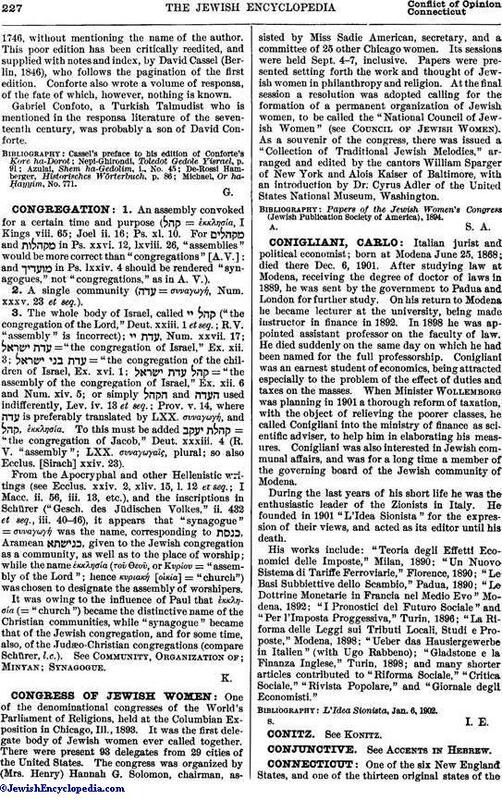 Conigliani was also interested in Jewish communal affairs, and was for a long time a member of the governing board of the Jewish community of Modena. During the last years of his short life he was the enthusiastic leader of the Zionists in Italy. He founded in 1901 "L'Idea Sionista" for the expression of their views, and acted as its editor until his death. His works include: "Teoria degli Effetti Economici delle Imposte," Milan, 1890; "Un Nuovo Sistema di Tariffe Ferroviarie," Florence, 1890; "Le Basi Subbiettive dello Scambio," Padua, 1890; "Le Dottrine Monetarie in Francia nel Medio Evo" Modena, 1892; "I Pronostici del Futuro Sociale" and "Per l'Imposta Proggessiva," Turin, 1896; "La Riforma delle Leggi sui Tributi Locali, Studi e Proposte," Modena, 1898; "Ueber das Hausiergewerbe in Italien" (with Ugo Rabbeno); "Gladstone e la Finanza Inglese," Turin, 1898; and many shorter articles contributed to "Riforma Sociale," "Critica Sociale," "Rivista Popolare," and "Giornale degli Economisti." L'Idea Sionista, Jan. 6, 1902.